Thank you. I'd rather not say too much. 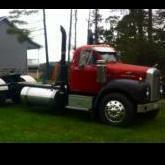 I worked many years for Mack. While at Mack, I never enjoyed life more. I can’t adequately express my heartfelt feelings for Mack Trucks. I can tell you that I have never known a finer high-caliber group of people. Simply put, there was no better company to work for than Mack Trucks. No other truckmaker had a family of employees from coast-to-coast and around the world with so much passion, dedication and pride. These qualities, I feel, were largely responsible for Mack’s successes. In the days of Mack Trucks, particularly under Zenon Hansen, you knew in your heart that you were part of something really special. Long after Mr. Hansen retired, the Mack spirit he created lived on at Mack World Headquarters, the plants, PDCs (parts distribution centers), Mack’s superb factory-owned branches* and the privately-owned Mack distributors. No matter where you were, the Mack family spirit was present. It was Mack pride and earned respect (never any arrogance) that allowed Mack to rise above the rest. Life at the other truckmakers was just a job. But at Mack Trucks, our work was an indescribably satisfying way of life. So it is extremely sad for any Mack veteran, like myself, to witness a foreign truckmaker purchase America’s truck industry icon and reduce it to a mere shell of its former self. If there was to be one remaining U.S.-owned truckmaker, it arguably should be Mack Trucks. With due respect to America's other truckmakers, no other U.S. truckmaker has contributed so much to America as Mack – “The Greatest Name in Trucks”. 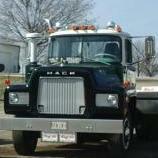 (Paccar executives have privately expressed sadness over what's become of Mack. That speaks volumes for the respect they had for the former Mack Trucks) *The factory-owned branches of Mack Trucks deserve special mention. From Atlanta to Richmond to Dallas, from Denver to Salt Lake City to Seattle, from Chicago (both the Wentworth Ave. and O'Hare branches) to Buffalo to Queens, no truckmaker in the history of the United States ever had a finer and more capable sales and after-sales support network than Mack Trucks. The Mack factory branches, I feel, set the benchmark for the entire industry. I can't say enough good things about the dedicated Mack men and women who made it possible. Job well done. .